In recent years, the global banking industry has developed something of a David and Goliath complex. 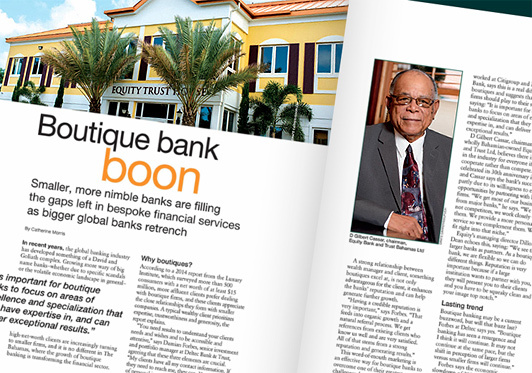 Growing more wary of big name banks–whether due to specific scandals or the volatile economic landscape in general–high-net-worth clients are increasingly turning to smaller firms, and it is no different in The Bahamas, where the growth of boutique banking is transforming the financial sector. According to a 2014 report from the Luxury Institute, which surveyed more than 500 consumers with a net worth of at least $15 million, more affluent clients prefer dealing with boutique firms, and these clients appreciate the close relationships they form with smaller companies. A typical wealthy client prioritizes expertise, trustworthiness and generosity, the report explains. A strong relationship between wealth manager and client, something boutiques excel at, is not only advantageous for the client, it enhances the banks’ reputation and can help generate further growth. As the Ministry of Financial Services looks to new products and new markets to further the sector’s development, boutique banks have a role to play. With wealth managers highly experienced in providing tailored services to meet complex needs, new products such as the Investment Condominium Fund (ICON) are eagerly welcomed by boutiques. Ivylyn Cassar wants to see a greater effort to engage emerging markets in the Middle East, India and South Africa. Equity has satellite offices in Dubai, Panama, Switzerland and the British Virgin Islands. The bank also plans to expand into New Zealand in the near future.